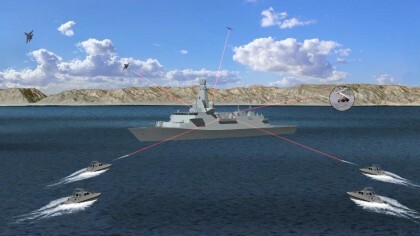 The United Kingdom’s Ministry of Defence (MoD) is finalising the agreement of a £30M contract with UK DRAGONFIRE, an UK industrial team led by MBDA, to conduct the Laser Directed Energy Weapons (DEW) Capability Demonstrator. UK DRAGONFIRE will achieve, through the Laser Directed Energy Weapons (DEW) Capability Demonstrator, a significant step change in the UK’s capability in High Energy Laser Weapon Systems and will provide the basis for technology-driven operational advantage. The programme will mature the key technologies for a high energy defensive laser weapon system and will include the engagement of representative targets in land and maritime environments in 2019. The programme will also provide the body of evidence for future procurement decisions. UK DRAGONFIRE is a collaborative consortium led by MBDA with QinetiQ and Leonardo-Finmeccanica that has brought together the best of relevant UK industry expertise to deliver the highly challenging and complex programme. The team also capitalises on the strengths of the individual companies involved, which includes GKN, Arke, BAE Systems and Marshall ADG. The UK DRAGONFIRE proposal builds on the significant MoD and Industry investment in the areas of laser coherent beam combining, weapon systems command and control, advanced pointing systems and high power storage.